Gearbox shooter Aliens: Colonial Marines has officially emerged from the dark. Gearbox's Aliens: Colonial Marines had been floundering around in space for years, but now the game is officially preparing for re-entry onto retail shelves. Sega has announced that the game's official release window will be spring 2012. So, it's a year away, but at least we can stop wondering what the deal is now. Of course, Aliens: Colonial Marines is based on the Alien movie franchise that pitted human against acid-spitting Xenomorph. The game will do the same. Gearbox chief Randy Pitchford says Aliens: Colonial Marines is "designed as an interactive successor" to the films. The first-person shooter will feature co-op, but even with friends it'll still likely be freaky as hell when Xenomorphs jump out of a ventilation shaft and run at you upside down. Colonial Marines' storyline revolves around the abandoned U.S.S. Sulaco. As Colonial Marines, players will have to explore the Sulaco to discover what happened to its crew. Clue: Xenomorphs. The game's first teaser trailer mentions names familiar to fans of the Alien franchise, so expect real connections between Colonial Marines and previous Alien media. 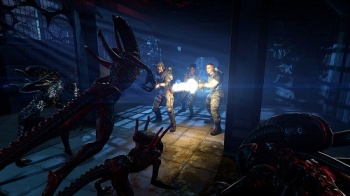 Sega and Gearbox will reveal more about Aliens: Colonial Marines at E3 2011. The game is in development for the PC, Xbox 360, and PS3.